You’ve probably heard the saying, “You are what you eat” at least once in your life. We are told that a diet of fresh veggies, protein, little starch and minimal sugar make us stronger and our skin more radiant. And, the ultimate beauty fix: drinking tons of water, helping us lose weight, clear our skin and keep our bodies hydrated. What goes into our bodies directly affects what we look like on the outside. We’ve been told this our entire lives, yet most of us still reach for the sugar shaker when pouring our morning coffee and order that bowl of pasta at our favorite restaurant more often than not. If you want to look better, you have to change your diet, or now, just use Vida Glow. 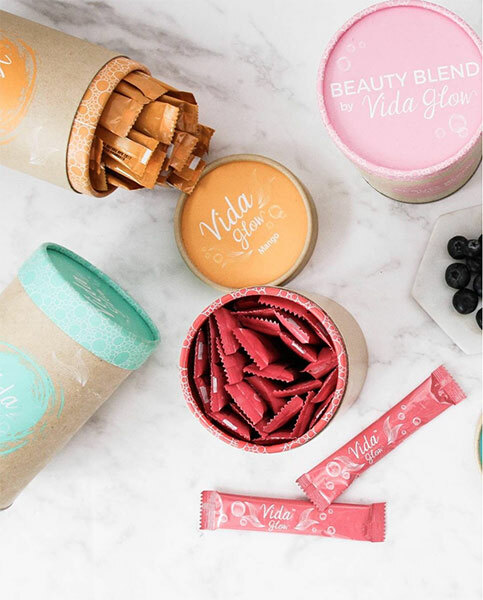 Vida Glow is a superfood beauty blend which comes in powder form, making it easy to add to any of your meals or beverages throughout the day. It’s main ingredient, marine collagen, is what truly alters your appearance, making you look and feel better with daily use. Collagen is the second most prevalent substance in our bodies, behind water. It Is the most abundant protein, and as we age the production of this protein slows and eventually ceases, causing us to spend thousands of dollars on the finest anti-aging beauty products and supplements out there. But, why not simply replenish that collagen we’ve lost? 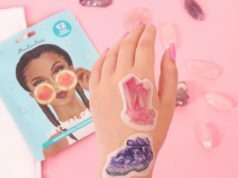 Vida Glow is an Australian company founded by Anna Lahey, who has had her own struggles with growing her nails, wrestling with unruly hair extensions and never seeing real results from her workouts. Vida Glow changed all of that for her when she discovered marine collagen in Japan. Japanese women have been using the benefits of this collagen for over 300 years…no wonder they’re all so beautiful. She purchased it at the Japanese pharmacy and within weeks, her skin was glowing. Now she wants to share this “miracle collagen” with you. With Vida Glow, you can help promote healthier skin, hair, and nails from within. Our experts have tried it and what we can tell you, will have us purchasing less concealer, without a doubt. One of our experts has always struggled with dark circles underneath her eyes, like many other woman and men, and the only help until now has been more sleep, more water, and a ton of under-eye concealer, but even that never seemed to get rid of the problem fully. Since using the Vida Glow marine collagen powder, our expert is dark-circle free and ecstatic with the results! At MyTopFace, we tried the Mango and Peach flavored powders from Vida Glow. We preferred to add them to our daily water intake for a more naturally hydrating fix, and sometimes we added to a glass of juice. 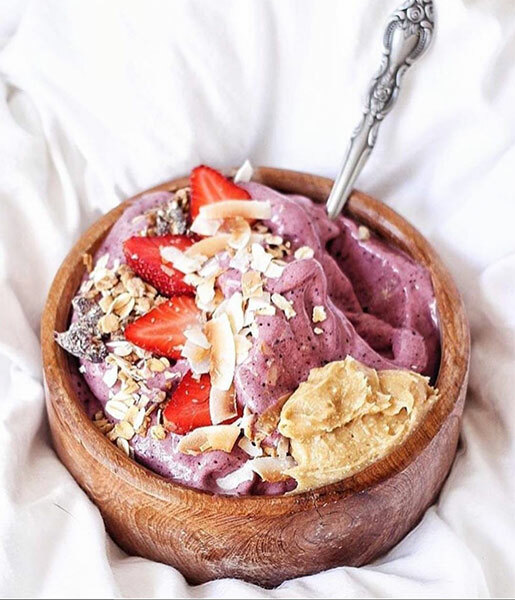 It tastes great, and knowing you’re ingesting something that could help make you even more beautiful makes it taste even better because it’s all the more worthwhile. Taking Vida Glow can also help you stay more hydrated, adding it to water, which none of us drink enough of through the day. Vida Glow gives you a reason to hydrate your body, which also helps your inner glow radiate to the exterior. Other transformations like more youthful looking skin, clearer complexions, diminished cellulite, reduced cravings for sugar and carbohydrates, increased energy and the ability to manage stress better, have been reported. The strengthening of nail and hair growth is just a bonus. Vida Glow keeps the body hydrate, helps you exercise better and helps maintain overall health. 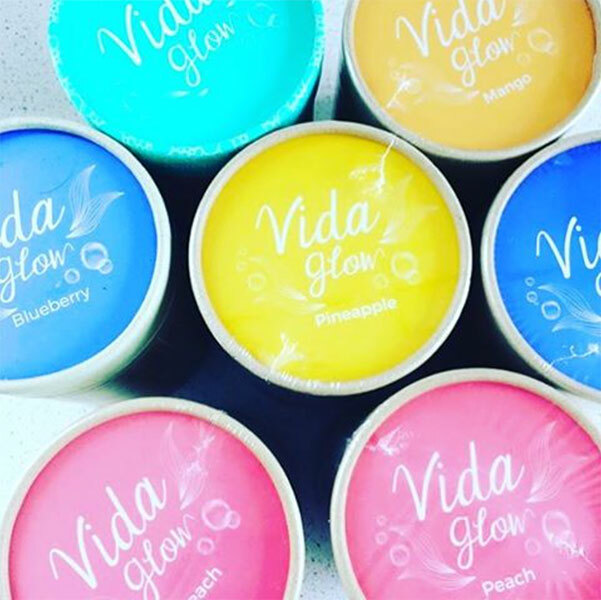 Vida Glow comes in six yummy flavors: Original, Peach, Mango, Blueberry, Pineapple and Beauty Blend. Each recipe comes in individual serving packets, but the Original and Beauty Blend flavors also comes in a loose powder formulation. 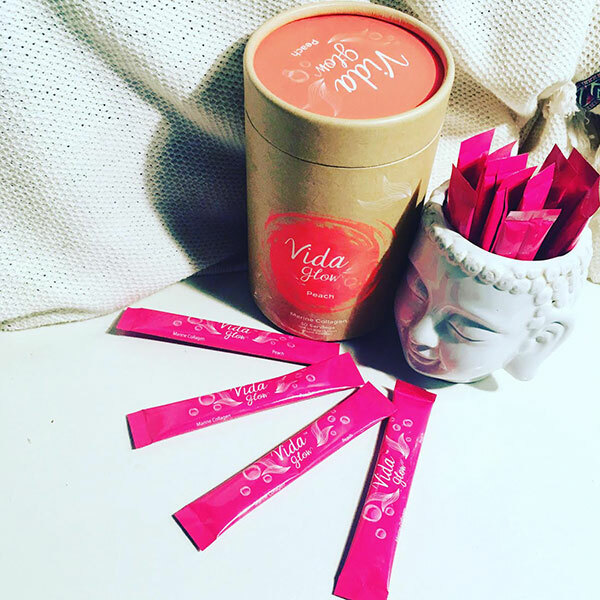 Because they come in shakable packets, you can get your Vida Glow on the go. With Vida Glow, the health benefits are numerous and the beauty perks, endless. Take Vida Glow to feed your inner and outer beauty. We all want to glow, why not Vida Glow?